I recently had one of those moments of epiphany. It was like a a huge bomb just went in my brain and I finally understood something I have spent years trying wrap my brain around. The light bulb over my head was shining brighter than the sun. It finally occurred to me why I find it hard to relate to or even whole-heartedly fit into so many homeschooling circles… including with some in the very group that I founded and have lead as president for over two years. I assumed it was something about me or my personality that made things not quite right. Oh my goodness I nearly jumped out of my seat! I feel exactly like Todd Wilson’s wife! My family has a deep conviction for homeschooling and it doesn’t seem like many other homeschool families feel the same way. In a world where I already feel different because of our educational choice I can feel alienated even among those who have made a similar choice. To talk with other women who don’t carry the same convictions, especially when things get bumpy, can actually be very discouraging. I recently started such a conversation, or I should say I tried to, and the whole thing spiraled into a discussion about who was planning to send which child into what school next year. And all of the women were congratulating each other for this because they viewed the moms putting their kids in school as doing the hard yet brave thing. NO! I was screaming inside! Sticking it out and doing what God has called you to do instead of taking the easy way out is the hard and brave thing! I was so disheartened. It was certainly not the lift-up I personally hoped to find. I found myself sitting in silence because to say anything to the contrary would have not have been the polite thing to do. My family’s beliefs about education were born from my own experience as a public school teacher and our own study of scripture. I saw first hand how absolutely inadequate the modern traditional school system is. And I write those words with trepidation because I don’t want to seem as if I’m saying anything derogatory about my absolutely phenomenal friends and family still working in the traditional school trenches doing the very best they possibly can. The fact of the matter is even with the most talented of teachers no school can provide the kind of learning environment that I think every child on this planet deserves. One that is centered on God’s word, in the context of family, and full of individualization. In fact I do not believe traditional, institutionalized schooling was even God’s plan for children. Over the next month I plan to blog more about what I believe is God’s model for educating children and what I view as the ultimate model of education (an ideal I strive to meet yet will likely always fall short of). Until then… convicted homeschool moms I’m praying for you that you can find the encouragement you need to run this marathon of educating your own children at home. And I also pray for the homeschool community as a whole. I fear if ever we face scrutiny or downright persecution from whatever powers that may be that we all find the strength to stick it out and now be blown away. 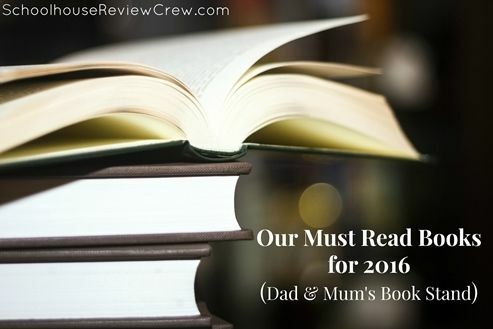 I’m making a list of books I am DETERMINE to read in 2016! Truthfully I’m going through my Kindle and sharing with you the back log of books I have there. Though I read quite lot I buy even more! Yes books to me are like shoes or purses to some women. Oh I take that back, I’ve always had a thing for a pretty purse. Here are the books at the top of my reading list for 2016. If you’d like to check them out in the Amazon store just click on the cover photo. I may update this post sometime in the year as finish these up and add more to my ever growing “To-Be Read” pile. Spritual Leadership by Henry & Richard Blackaby. I’ve only just started this book and I have to say the very first pages have me thinking about leadership and the leaders I know. In my life I am a mom and that makes me a leader for my children. I also lead a fairly decent sized co-op and I assist my husband in his ministry. So this goes definitely goes on my list. Alone with God by John MacArthur. I have a thing for books about prayer. If I can make a confession here I would say that sometimes I wonder if I should spend my time actually praying instead of reading about prayer… however this book promises encouragement for my alone time with God and I know that I can definitely use that. This year my husband and I will celebrate 15 years of marriage. It’s been quite a wonderful ride though we’ve had our fair share of hardship and difficulties. I’m looking forward to the next 15 years and hopefully doing things even better. I started this devotional at the first of the year. So far I’m truly enjoying it. This author has a true gift for what she writes. The reviews on this one are phenomenal. So I agree with them. I’ve read this one before. I need to read it again. Yes it is that good! I’m not sure a book needs any more explanation. The title sort of says it all! I’ve been following a Facebook group this author created. She has some very good advice. I’d love to get for my children to get some college credits out of the way as highschoolers. Time to start planning! This book will be another reread for me as well. I try to read this one every year. It keeps my brain in focus when I think about WHY we homeschool. It’s something of a homeschooling “bible” for me. This is considered to be a classic homeschooling text. I’ve read other books by John Holt and I admire his courage. His voice as a former public school teacher (like myself) and his boldness to declare everything he sees wrong in traditional education. It has been said every homeschooler should read this one and I probably will agree. I’d like to see our homeschool become a little less structured. My children don’t always have the confidence to research their interests on their own. Maybe we can change that this year. Check this one out? I only just noticed this while hunting down the links to the other books I’m sharing with you! I am struggling with inspiring my children to read really great books. The seem to love JUNK! They love it if I read great books aloud to them but they don’t choose them on their own. I wonder if this will help. Yep, it’s hitting my must read list! I love absolutely everything I’ve ever read by Sally Clarkson. This book actually won’t be released until February but I didn’t even hesitate to hit the preorder button. I’m really hoping to bring even more warmth, love, and joy to our home this year. All of Sally’s books have helped me shape our home. I’m sure this one will too. Another classic I’ve been meaning to read for some time. This could have fallen under homeschool as well. Another Sally Clarkson book I know! But her books so inspire me. I read her Ministry of Motherhood and it totally changed my view of myself as a Stay at Home Mom. I wonder what impact this book will have. One thing I’d like to change in the new year is how busy and over-committed I tend to be. I’m really hoping this book can give me some insight into how to say yes only the the very best things in life and then, of course how to say NO at the right times. I’m going to stop with my list here. There are so many more I could add. The world is just full of so many fantastic books that I’ll never get to them all! This is a great start for 2016! Care to share any books YOU plan to read? Click below to see what other Review Crew members are planning to read this year! If you know anything about my family and our homeschool than you know that we take our field trips seriously! We LOVE to get out and explore. I’m a big believer in making school as hands on and adventurous as I possibly can. Of course I love to record where we’ve been and what we learned. I didn’t have a perfect system for that so I was excited when I was given the opportunity to review Exploring Creation Field Trip Journal by Apologia Educational Ministries. This is a very nice quality spiral bound notebook. It lays flat when opened. The front and back covers are made from a nice quality laminated stock that will hold up well to lots of handling. This is a very good thing. If your field trips are like ours than this thing will get tossed into backpacks, laid on top of coolers, bounced around the van, and thumbed through by lots of little (or not so little) hands. Even the pages are printed a fine quality thicker stock material. Preparing for the field trip – this section contains tips for you as the teacher. What things can you do in the weeks or days leading up to the trip to prepare and therefore get the most from you experience. How best can you pack for the trip, what can be done on the way to the destination to ensure safety and success. In this section, for example, they suggest the teacher do a little research about the location/history/topic so that he/she can be at the ready to answer questions and guide the experience. They have suggestions for students as well. Field trip ideas – here you’ll find two pages of field trip ideas (over 100) segregated by topic. The suggestions are generic, for example visit a Planetarium under Space/Aviation, in order to make it relevant to just about anyone no matter where you live. Places I’ve Explored – these are pages dedicated to recording the various places your family has explored within your state, country, and the whole world. Field Trip Pages – There are 12 specific trip pages to record details about specific experiences you’ve had on trips that you want to remember. My Special Spot- This is a great place to record seasonal wildlife. Children can draw or place photographs of what they see. Thoughts and Drawings As I See It – This is sort of a journal/sketchbook section. Some pages have little prompts like Movement, or Predators & Prey. Others are totally open ended with no prompt. Since we received this journal a couple of months ago we have been on at least four field trips.. no five… wait it might be six! Plus there was supposed to be one other that was postponed. It is spring time, we’ve been cooked up in the house all winter… it is time to GO GO GO! We used this journal to record four of those trips. A couple of them were to places we’ve visited dozens of times (museum passes are a Godsend) so we chose not to record those and instead stick to new or out of the ordinary experiences. So far we’ve mostly used the pages related to Specific Trips. Before a trip I did a google search to see if I could come up with a map that I could download. We taped that into our journal. Then I attempted to answer the questions as they are laid out. One asks for an Emergency Contact Plan. This is always… Call Daddy. Then I ask the kids what they’d like to see or do at the destination and I record that. There is a section for recording books we’ve read to prepare for the trip. After the trip we fill in the last two sections… Story of my day and Something I never want to forget. I also print of a photo from the day and include that too. We’ve also tried to fill in the Places I’ve Explored pages. Plus, since it is spring we recorded some observations from our yard on the My Special Spot in Spring page. This is a great quality product. It is well made, bright and colorful, and chock full of great ideas and pages that will help you get the most out of your field trip experiences. I think it could be even better though. As a seasoned homeschooler I don’t feel like I need the Preparing for a Field Trip pages. These would be great as a web link or download but they don’t need to take up two pages of the Journal. We personally need way more Specific Trip pages. 12 isn’t nearly enough if you are really an on the go family like we can be at certain times of year. I could potentially fill those pages in 3-4 months even if we only included NEW places or experiences that were some how novel. I’d love to see that section seriously beefed up with 3-4 times as many pages. That way if you are an on the go family like my own, one book could cover a year. Another family that doesn’t venture out quite as much could keep this book going for a couple of years. Over all though. This is a great journal and if you’d like a great place to track your field-trip memories you’ll really enjoy this product. Homeschooling is MESSY! My house is a DISASTER most of the time! Not only do 6 of us live here but 5 of us work here as well. ALL.DAY.LONG. Books! Oh my goodness the books! We go to the library and take 100 out at a time. I haven’t found a basket large enough to store them all. Even if I did these are children you know. Books are EVERYWHERE! Books on the floor, on the table, on the couch, on the stairs, on the kitchen table, on the counters. If it is a flat surface there are books on it. When this photo was taken not only was my living in homeschool chaos mode but also being prepped to be painted! Or papers… or pencils… or crayons… or art supplies… or some projects…. some creation… a really cool thing my son found outside. No matter how organized, how many routines and systems I put into place… homeschooling is just a mess. When I was teaching preschool in the public schools I told all of the parents before the year began… “A messy child at the end of the day means the spent their time learning.” A messy home at the end of the day means my children spent their day learning. Someday when they are all gone and living life on their own I will miss it. Our mess means life and learning are happening right here every day under my roof. What else can I ask for? I thought it might be helpful to do an updated post on our current homeschool curriculum choices! Math – Teaching Textbooks and Math-U-See Teaching Texbooks is our main curriculum but we add in some Math-U-See for extra practice. Language Arts – Institute for Excellence in Writing We use both their Student Writing Intensive Level A and their new Grammar program. Spelling – We have a subscription to VocabularySpellingCity that I reviewed here. That’s the main chunk of it. I’ll revisit this in about 6 months! It seems to be ever changing! That Time I Hit a Slump! It’s January! That time of year, every year, when the days are long yet the sun sets early. When its so cold and the snow makes it such a drag to go out that we stay home probably way too much. It is the time of year when I look back to September at all of my hopes and plans and I realize we aren’t where I had hoped and I get discouraged. I seem to ignore all of the side tracked bunny trails we’ve traveled down that were so rich and worth every moment. Time to reassess and revamp and dive in anew. Our homeschool has lost some of the hands-on fun that really got us excited about learning. It has been some time since we’ve done a lapbook or a science experiment. Why have I let those things slide away? I know I’m not alone. A lot of my homeschool moms find themselves in the slump come winter. Maybe it is time to take a poll and find out what they do to pull themselves out. What do you do?